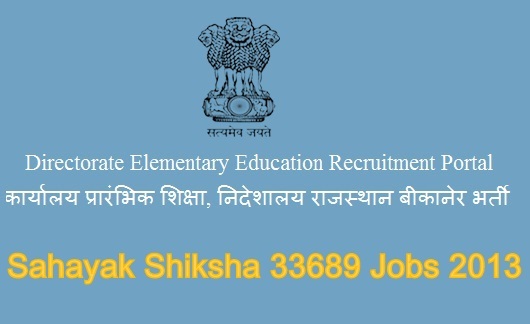 Department of Elementary Education, Bikaner (Rajasthan) issued recruitment notification for 33689 Post of Shiksha Sahayak / Education Assistance post under the Direct Recruitment. Interested Candidates have to apply via Online mode on or before 2nd July 2013. Age: candidates who want to apply for mention post their age should be between 18 yrs to 35 yrs as on 01-01-2014. Qualification : Candidates must have passed Secondary Examination (Class Xth) from any recognized Board. Application Fee: Rs. 275, Rs.175 for SC/ST/OBC candidates. Selection Process : Selection will be based on 70% marks to Class 12th % and 30% to experience with marks 10,20,30 as per experience. How to Apply: Interested Candidates would be able to apply Online from official website www.ea.rajshiksha.rajasthan.gov.in from 03rd June, 2013. Candidates are advised that kindly read the instructions carefully while going to fill Online application form.